Find out what you need to know about investing in ultrashort ETFs. Exchange-traded funds have taken the investing world by storm, and one of the reasons why ETFs have grown so popular is that you can get just about any kind of focused exposure to specific market niches that you want. But one type of ETF in particular has gotten a lot of attention because of its ability to let you make large bets against certain types of investments. Known as ultrashort ETFs, these exchange-traded funds use a combination of leverage and derivatives to produce positive returns when their target benchmark falls in value. But before you invest in an ultrashort ETF, it's important to know how they work and what risks they carry. An ultrashort ETF is an exchange-traded fund that holds assets whose value goes up when the fund's targeted asset-class benchmark goes down. For instance, an ultrashort ETF that targets the S&P 500 might be set up so that its value will rise by 2% or 3% if the S&P 500 declines by 1% on a given day. Conversely, if the S&P 500 rises, then ultrashort ETF shareholders suffer magnified losses on their investment. Even industry giant ProShares acknowledges the risks involved with inverse leveraged funds. Image source: ProShares. The most important thing to understand about most ultrashort ETFs is that they're designed to track the daily performance of a given benchmark index. That doesn't always translate into long-term performance that matches what you'd expect based on a fund's name. So, for instance, a two-times ultrashort ETF might rise 2% when the market falls 1%. But if the market falls 10% over the course of a year, there's no guarantee that the ultrashort ETF will rise 20% -- and, depending on the fluctuations in market prices, an ultrashort ETF can even lose money in a down market. What is the history of ultrashort ETFs? The ultrashort ETF is a relatively new phenomenon, having first become available in the mid-2000s. That means ultrashort ETFs were available to investors seeking to take advantage of the financial crisis and market meltdown of 2008, which saw the value of many ultrashort ETFs targeting the stock market soar in response to the crash in stocks. Since then, though, ultrashort ETFs have performed abominably, with strong and steady advances in stock markets causing disastrous losses for those betting against the market. For example, the ProShares UltraShort S&P 500 ETF (NYSEMKT:SDS) has lost 85% of its value over the past five years, and investor interest has lagged accordingly: The fund's assets under management have dropped from $4.7 billion in mid-2009 to just $1.6 billion today. Ultrashort ETF Total Return Price data by YCharts. How many ultrashort ETFs are there? You can find dozens of different exchange-traded funds that offer leveraged inverse exposure to given markets. Some ultrashort ETFs focus on popular stock indexes like the Dow Jones Industrial Average and the S&P 500, while others are designed to track specific sectors of the stock market or certain niches of other asset classes such as bonds and commodities. In addition, some companies specialize in double-inverse ultrashort ETFs, while others go the extra mile to seek out triple-inverse returns for their shareholders. The largest ultrashort ETF is the ProShares UltraShort 20+ Year Treasury ETF (NYSEMKT:TBT), which had about $4.4 billion in assets under management as of early August. The ETF is designed to rise in value if bond prices fall, which would correspond to a much-anticipated rise in interest rates that many see as an inevitable consequence of the Federal Reserve's recent actions to curtail quantitative easing and return the bond market to more normal conditions. 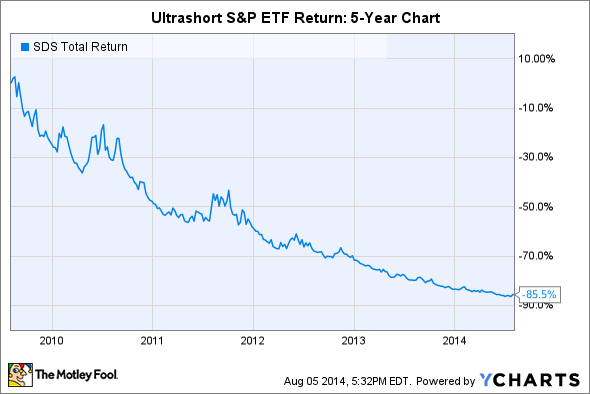 Why invest in ultrashort ETFs? The idea of trying to make money when certain assets decline in value is a reasonable goal for investors. The problem, though, is that the leveraged bet made by ultrashort ETFs adds a short-term component to the investing strategy, and that makes them unsuitable long-term investments in most cases. Ultrashort ETFs can make big gains if the market falls quickly, but they don't always work in the long run. Specifically, the danger with ultrashort ETFs is that volatility in the underlying benchmark can erode the value of the ETF even if the benchmark itself remains almost unchanged. The reason has to do with the mechanisms that an ultrashort ETF uses to track those daily changes. If the underlying benchmark rises and falls on certain days but ends up in the same place over multiple days, then ultrashort ETFs will lose value even as the underlying benchmark remains flat. In some cases during the financial crisis, that led ultrashort ETFs to lose value even when their corresponding benchmarks fell over the course of a few months. As a short-term bet on a particular market falling, owning shares of an ultrashort ETF can be your most aggressive way to profit if your suspicions prove correct. But many investors have been surprised at how quickly these funds' returns can erode in comparison to the markets they're supposed to track. Keeping that in mind can help you prevent your ultrashort ETF position from turning into a disaster.